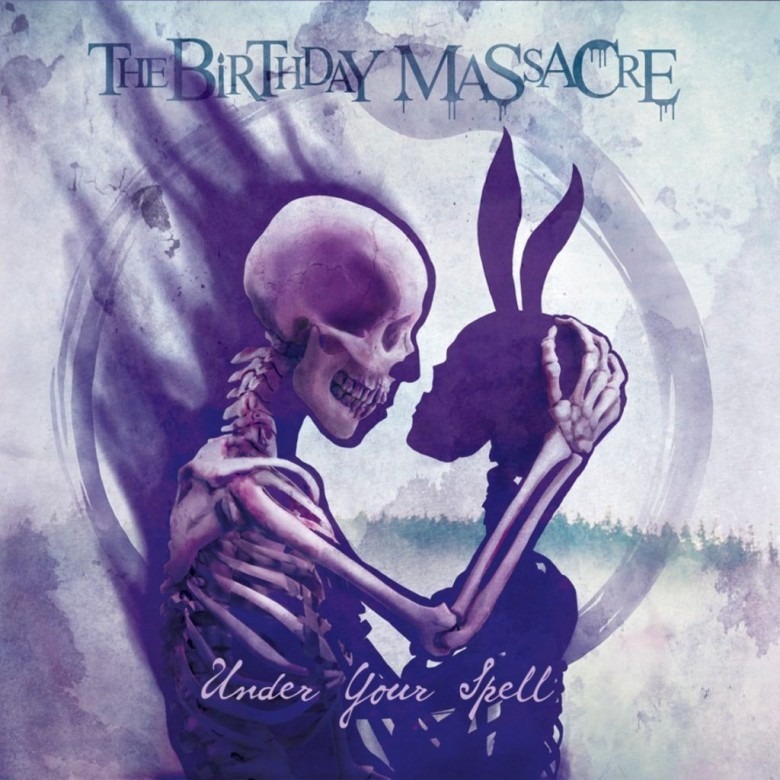 Home / Music / Of Love and Death: A Review of The Birthday Massacre's "Under Your Spell"
Attempting to cover a record that may have flown under some radars this year, I went into Canadian darkwave/synth-metal-pop band The Birthday Massacre's new album, "Under Your Spell" with high hopes. The band has always struck me as something of an enigma in the metal world, with a singer (Chibi) whose voice recalls the female pop stars of the '80s like Cyndi Lauper. I always describe the band to friends as though "Cyndi Lauper had gone metal." The band takes the best retro, beefy synth backings of the '80s and mixes it with crunchy guitars and presto, you have a group that strangely and cooly enough can appeal to fans of pop and metal. The band's last record "Superstition" was very good. Certainly not perfect, but probably the best the band has come out with thus far. It was as hooky as all get-out, and the guitars and synths were tuned perfectly to each other which created some wonderful melodies and harmonies, as well as a fair amount of aggression on some songs. So going into "Under Your Spell" I was expecting the band to change it up a bit, perhaps push that wonderful concoction of the last album even further. And before I begin I'll say this: when this album is on, it's ON. But when it's not, it tends to get muddy and songs blend together and are just unmemorable or swallowed in the way they're mixed. The album starts in a stellar way with the first two songs. "One" is a twinkling and anthemic look at loneliness and coming to terms with the facts of the world and being content in a part of it all, good and bad. It's an example of the band at their absolute best, with haunting and swirling synths and a wonderful vocal melody that seems to evoke exactly the message the band is sending through their lyrics here. The next song is equally great. "Under Your Spell" starts the theme of love, which pops up again and again on this album. The song clearly knows the meaning of less is more, as the throbbing bass and pulsing synths drive the verses, ending the melodrama that I love so much about this band taking full effect as the guitars come in. It's a perfect blend of those metal and pop elements. Up to this point, vocalist Chibi has really kept her voice more subdued, and surprisingly, it works very well. And unfortunately it's at this point that the album goes from hit to miss, and more often miss. "All of Nothing," is a dubstep influenced track that also begins one of my main annoyances on the tracks ahead. The mix on this album puts the guitars way up, so it's hard to hear the synth melodies in the background. Which is a shame, because they're really the stars of the show in this band's catalog. "Without You," is an all right track, with some decent melodies and it fits well with their previous offerings on other albums. However, the next track, "Counterpane," is the last great track on this record. The guitars are ferocious as the track begins and Chibi's vocals are light and airy, but really hit that perfect peak '80s vibe during the chorus. That's exactly what I'm looking for, and it's here. This is probably the most straight-up rock track on the album. And from there on, you get a blend of dull tracks with melodies that just seem to hang in this middle ground. There are some interesting moments to be found here and there. "Games" has potential, as the instrumentation is really great, with solid guitar and synth melodies, but again, the mix is unbalanced and the vocal melodies are just not exciting. "Hex" got me excited at first, but it's also the biggest letdown, because it could have been great. By the time the chorus rolls around, everything just seems to muddy up and become a wall of sound where nothing really pierces through. It's too bad, because Chibi's voice sounds great on this track. "No Tomorrow" might be liked by some for the growling, aggressive vocals from Chibi and the chugging rhythm, but I'm always on the hunt for great melody, and this track did not have it. The last two tracks, "The Lowest Low," a slow burn track that ambles along without really going anywhere, and "Endless," another song that feels in line with previous Birthday Massacre offerings, just didn't grab me. To be honest, "Endless" also had a very anti-climactic ending, which is not what I wanted. The Birthday Massacre is at its best when their vocal and instrumental melodies are punchy, emotional, and hooky. It's almost awe-inspiring when they really dig deep and let loose. They proved they could do it on their last record, and even started this record with some really great examples of their brand of pop metal done right. Unfortuantely it dissolved into a record on which the majority of songs are just uninteresting and bland. Pick out the tracks you like, and skip the rest. I wanted to love this record, but as The Birthday Massacre might write, love sometimes has a dark side.